scholars, academics and general readers who are interested in the country’s political, civil and constitutional issues. This new, fifth edition, has seven new chapters added, along with four new appendices. The extant chapters have been completely revised and updated with recent developments. 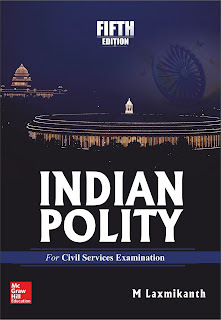 Indian Polity 5th Edition by M. Laxmikanth boasts off few important new topics and existing content has been upgraded. * Language of the book is extremely simple and straight forward and it still feels like you are being spoon fed by the author. This is great for students who are preparing on their own. I recommend this book to first time buyers as well as those who have the 3rd/4th edition of this book. Else, you can take photocopies of the additional material from Delhi bookshops. But must update the earlier version. About the Author: M Laxmikanth is an author and trainer who is specialized in writing books for the preparation of Civil Services competitive exams. Apart from the book Indian Polity he has written various other exam prep books like Governance in India for UPSC Civil Services Preliminary Examination and Public Administration. All these books are also available in the Hindi version. After completing his Master's degree from Osmania University in 1989, M Laxmikanth started his own coaching academy named Laxmikanth's IAS. He possesses a great experience in teaching Civil Service Aspirants. This blog is very useful for aspirants.